Products: Casino, Bingo, Poker, Sports Betting and Lottery. 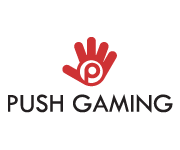 Push Gaming specializes in developing and distributing from land-based games suppliers to the interactive world. Push gaming recently teamed up with Quickfire, to integrate a number of games developed by Magic Dreams group an Italian based company. 18+ Only. The minimum deposit for both deposit match bonuses is €20. The deposit match bonuses are subject to a wagering requirement of x40. Winnings from the free spins are subject to a wagering requirement of x35. Deposits made using NetEller or Skrill does NOT qualify for the welcome bonus package. 210 No Deposit Spins + more! 18+, 210 No Deposit Spins distributed in batched of 10 for 21 consecutive days. 50x wagering requirement, Use bonus codes to claim offer. 18+, Wagering requirement of 35 times your total player balance, Minimum deposit €20, Use bonus code to claim offers.